A fire ravaged through the Dean family's home early Tuesday morning, destroying everything. That's the family of former Junior Journalist, Daylin Dean, who appeared with us on 13WMAZ from 2009 to 2011. 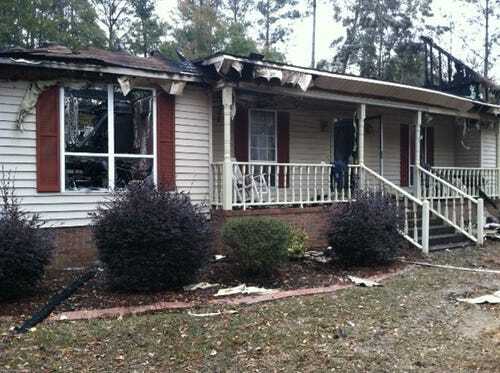 The destruction is clear, the smell of fire still evident when 13WMAZ's Anita Oh visited the house early Wednesday. "It's an empty shell of what it was," Dean said. All that's left from the home is a letter-man jacket, some old trinkets and a few CDs. "They told me you don't have anything left," Dean said. "It's just hard to think you don't have anything." Investigators say the fire most likely began in the garage, but they are still piecing together exactly how it started. The Deans say they lost everything, from clothes to photos to precious keepsakes. They escaped the burning house with just the clothes on their backs. Daylin's mother, Christie, says material things are replaceable. "This can all be replaced," she said. "As long as we're together, all 5 of us, and we're good, that's the most important thing to be thankful for." Joyce Brown, who lives across the street, was the first to report the fire. "From my front blinds, I saw a glow and I immediately got up, looked across the street and the Deans' carport or garage was completely engulfed in flames," Brown said. It's support from these neighbors that the Deans say give them strength to rebuild their lives. "I know I was looking for a toothbrush this morning and my daddy brought out a bucket with about 50 of them," Daylin said. "People that we didn't even know would just come, stop by, 'What do you need? Food? Clothing? Whatever it is, we have it,'" Christie said. Just in time, the Deans say they're giving thanks now, more than ever. Donations can be dropped off at the State Bank of Cochran, 112 Beech Street, under "The Dean Fund" or at Woody Butts Chevrolet, 302 SW Dykes Street. The dealership has loaned cars to the Dean family for the time being. Follow 13WMAZ's Anita Oh on Twitter @anita_oh and on Facebook Anita Oh WMAZ.